Adobe Premiere Elements 4 was released in September 2007, with new emphasis on a cleaner interface for quick and fun editing. It includes integration with Photoshop Elements 6, new automated Movie Themes, and an updated Sharing Center with export to mobile devices, websites, and HD video. The pricing is unchanged: Premiere Elements 4 is $99 list ($79 street); or $149 list ($135 street) bundled with Photoshop Elements 6. See my full article for a summary of new features and enhancements, plus a visual tour of the Premiere Elements 4 interface and features. What's next for portable media players? Everyone does FM and voice recording and now video playback. But then there's wireless Bluetooth to play on headsets and even integrate with mobile phones, plus support for the AAC format to open up possibilitites for sharing music with the iPod line. Samsung is driving these directions with its line of new players -- the (not very helpfully named) YP-P2, T10, and S5. 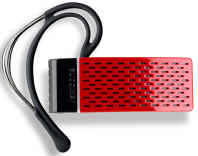 These all feature Bluetooth connectivity to play wirtelessly to stereo headsets and portable speakers (including the new Samsung YA-BS 300 Bluetooth Stereo Speaker -- coming soon). And, with an upcoming firmware upgrade due in December, they will support paring with mobile phones to answer calls -- no need to get out the phone when you get a call while you're listening to music. Samsung is promising an aggressive upgrade schedule, adding Bluetooth file transfer and support for AAC audio in December, games and more functionality in January, and more user-derived features in March. The integrated 1.5 W stereo speakers slide out and tilt for playback. It even can be used as a speaker phone when paired with a Bluetooth-enabled mobile phone. See previous post on the Samsung Music Players. See the Portable Media Players Gallery for details and comparisons. The updated line of Microsoft Zune portable media players is due to ship next week, with a disk-based player with more capacity, the first flash-based players, an updated software interface, relaxed restrictions on Wi-Fi sharing, and a new online community Web site. I haven't had a chance to try them out, but you can check them online, and see my Portable Media Players Gallery for details and comparisons. A new black Zune 80 GB hard-drive model ($249) joins the original 30 GB model ($149) -- with a slightly larger screen (3.2" vs. 3") at the same 320 x 240 resolution, and weighing less (4.5 vs. 5.6 oz.). 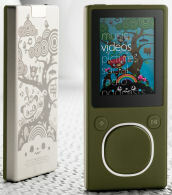 Plus, the line adds two models with flash memory, the Zune 4 and 8 GB ($149 and $199), available in pink, green, black, and glossy red. The screens are 1.8", but still 320 x 240, and they weigh 1.7 oz. The added models have a new Zune Pad touch-sensitive navigation button, and a redesigned PC and device software with new menus and look and feel. Existing Zunes also can be updated with the new software. All the Zunes continue to have a built-in FM radio, and Wi-Fi wireless networking (802.11g,b, 54/11 Gbps), with range up to 30 feet. While the Zune is positioned as a “connected entertainment" device, the original Wi-Fi networking was usable only for Zune-to-Zune sharing, and shared music was heavily restricted -- even unprotected files. The slightly relaxed restrictions now allow you to listen to shared songs up to three times, but with no time restrictions (they used to expire in three days), and songs that were shared to you can now be passed on to others. The Wi-Fi connection now also can be used for wireless sync with your PC media collection. Finally, Microsoft has developed the Zune Social beta online community Web site to share your music tastes, knowledge and experiences with others. You even can create a Zune Card and personal profile at Zune.net to reflect your musical identity, and have the Zune software automatically post updates to reflect your music listening on the Zune or your computer, including most recently played tracks. The new Microsoft Zune players will be available tomorrow. See my previous post for a summary. Microsoft is offering some interesting options to customize your player -- not just covers or stickers, but permanent laser-engraving. See Gizmondo's Complete Guide to the new Zunes for a walk-though of the PC and player interface changes. See my Portable Media Players Gallery for details and comparisons to other players. Did you think broadcast TV was going away, replaced by subscriptions to hundreds of channels of cable service, and then Internet TV? But broadcast is coming back, not only with digital TV, but also with like TV service to mobile phones. You already can get popular TV channels with the Sprint TV service, and subscribe direct from MobiTV to watch 30-some live TV channels on mobile phones or PDAs (and on your computer). But you can imagine that the cellular carriers are not enthused about the idea of having their data networks swamped by masses of mobile subscribers continuously streaming different video content. The answer, of course, is to replace our phones with yet another service to bring real live TV, broadcast directly to your phone like the good old days of TVs with antennas. One was to avoid this whole problem is to offer content only in chunks, with time outs from streaming for the network as you select each clip to play. This is how you use the Apple iPhone to play clips from YouTube. It's also the model for the Verizon Wireless V CAST Video service, which offers recent edited highlights of news, sports, popular shows (like the Daily Show from Comedy Central), and music concerts. Think of clips for a newscast or sports wrap-up show -- not live TV, but recent updates. But for real live TV, a better answer is to take the demands of continuous streaming off the cellular data network, and move to a broadcast model for the mass-market content. All this requires is deploying a parallel network on cellular towers that can broadcast a core group of the same 20-some popular channels live, to be received as digital TV by all mobile subscribers simultaneously. With most popular content off the standard cellular data service, it's still available for our own personal uses and more niche content. The two formats driving this idea are QUALCOMM MediaFLO, particularly in the U.S., and DVB-H (Digital Video Broadcast-Handheld), particularly overseas. Verizon Wireless has introduced the MediaFLO service in the U.S. as V CAST Mobile TV (press release), launched in major U.S. markets this year. The service currently includes eight channels of scheduled live content and other programming for mass audiences (CBS, Fox, NBC, MSNBC News, Comedy Central, ESPN, MTV, Nickelodeon). 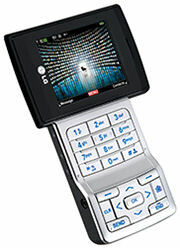 The Mobile TV service runs on the LG VX9400 phone, with a swing bar design -- a large color LCD screen (~ 2 1/4") that swivels for landscape TV viewing. I tried out the Verizon Mobile TV service in New York City recently (it's not available in central New Jersey yet), and got good reception around the city. The signal started up relatively quickly (10 seconds or so), and channel changes took a few seconds, equivalent to today's digital TVs. 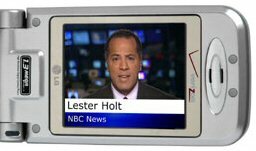 The picture was great on the LG VX9400, and particularly when swiveled to landscape mode many of the text crawls at the bottom of the screen were quite readable, including on news channels and ESPN poker broadcasts. The TV reception did fail inside a building near Battery Park at the bottom of Manhattan, though it did come in intermittently when standing by the outside windows. And there was no reception on a train under Penn Station -- even though the Verizon 1X and EV-DO signals are still quite strong there. (It would be nice to have a signal strength meter for the broadcast signal as well.) But when the train emerged out of the tunnel on the New Jersey side, the TV signal ran great almost all the way to Newark. See my Mobile Communications Gallery for details and related products. Portable MP3 players are wonderful for entertaining kids on long trips, and digital cameras are great for kids to get creative and have fun, but what parent wants to risk their digital devices for the kids to run around and play with? 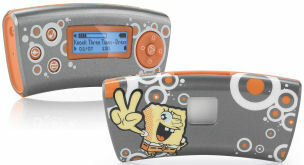 Especially for younger kids, Imation/Memorex has partnered with Nickelodeon to offer a better solution -- the new Npower line of consumer electronics products, featuring familiar Nick personalities including SpongeBob SquarePants, Dora the Explorer, Go, Diego, Go!, and The Naked Brothers Band. Released starting in October, the full Npower line has more than 20 products, including digital cameras and photo frames, MP3 and video players, an alarm clock, and even a LCD TV and DVD player. The products are designed to "combine ruggedness, affordability, and functionality with both the irreverent Nickelodeon personality and the specific attributes of the brand's most iconic characters and personalities." They're fun, simple to use, and useful for kids. - The simple Fission Digital Music Player for $49 has an easy-to hold design with a slight curve, at 3.6 x 0.7 x 1.7 inches. It plays MP3 and WMA formats, including protected WMA files. The Fission also has a microphone for voice recording. And for fun, with the Music Mixer feature you can shake the player to the beat to add silly instrument sound overlays (Boing, Foghorn, Marimba, Ukulele). When I tried out the Fission, it interfaced well with Windows and Windows Media Player to synch songs onto the player and re-build the artist tag information for easy playback. I did find the interface a bit clunky -- you have to hold down the Menu button hard to access the menu, use the Left/Right control pad to navigate (but not Up/Down, even for vertical menus), then press Menu (and not Center on the control pad) to select while navigating, and then press Menu hard again to exit the menus. - The compact SpongeBob SquarePants Flash Micro Digital Camera for $19 features a striking yellow SpongeBob eyeball design, has a small LCD used for a few digits of status information, plus a built-in USB connector on the bottom. It shoots medium-res JPEG photos good for sharing by e-mail or on the Web. The 8 MB internal memory can hold 24 fine-quality or 84 normal photos at 640 x 480, 93 fine or 179 normal at 320 x 240. It's 3.2 x 0.8 x 2.2 inches. 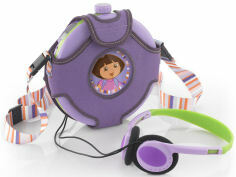 The Personal CD Player is designed for preschoolers (3 to 5 year olds), in Dora the Explorer and Go, Diego, Go! models, for $24. It has a clever canteen-style design with carrying case, shoulder strap, a twist-cap control knob. For kids on the move, it includes 60-second anti-skip protection. See my Portable Media Players Gallery for details and comparisons with other players. Stressed by lost calls on your mobile phone? Tired of searching along windows or by open doors for even one precious bar of cellular signal? Instead of you having to go find the signal, bring the signal indoors to you with the Wi-Ex zBoost line of cell phone signal boosters. These replicate the cell signal from outdoors to indoors through a window attachment that is wired to an indoor antenna, giving you multiple bars of signal in what was previously a dead area. The Wi-Ex (Wireless Extenders) zBoost product line includes models for different locations (home, car, office), and single and dual-band models for the two main cellular bands. We tried out the zBoost zPersonal (zP), which creates a cell zone of 4 to 6 feet radius, for a single user (one call at a time), and works with both cellular bands ($169). The product has two components: the zBoost box (~5 x 4 x 1 1/4 in.) and a small antenna (6 1/4"), connected by a thin 20 foot cable. To set up the unit, find a window with at least one bar of cellular signal, and attach the zBoost box with the two suction cups. Then run the antenna to the center of your workspace -- It needs to be at least 10 feet from the main console (or else a red light blinks to tell you to move them further apart). Finally, plug in the main unit. We tested the zBoost zPersonal in the basement, where runs of old plumbing, pipes, and concrete walls result in very limited service. Starting with only one to two bars on an AT&T (Cingular) phone, within ten seconds the zBoost jumped the signal to an amazing six bars (better then the reception on the ground floor). We also saw good results with the zBoost in other rooms and floors and buildings, turning marginal signals into strong reception. This also can help extend the battery life of phones, as they no longer have to struggle to stay connected. - zBoost Dual Band ($399) extends coverage up to 3,000 sq. ft.
See my Mobile Communications Gallery for more details. MP3 players and even mobile phones are great for enjoying personal music through earphones, but sometimes it would be nice to share the music with others, or just enjoy our collection playing in our own room. You can use a speaker dock for iPods and other players, but a better answer can be wireless Bluetooth speakers -- no wires, just playing music from any compatible cell phone or media player (see Portable Speakers in my Audio Accessories Gallery). Wireless speakers will make even more sense as MP3 / portable media players beccome more common -- like the new Samsung P2 portable media player and other devices in the product line (see recent post). 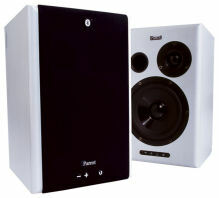 The BS300 speakers support stereo audio, with Bluetooth 2.0, and a wireless range of up to 32 feet. And as a bonus, they do include a line-in jack for listening to wired audio devices the old-fashioned way. The speakers have play controls (Play/Pause, Forward/Back) and volume for your music. They also include Samsung's DNSe (Digital Natural Sound engine) technology to add 3D Surround Sound Stereo and/or Bass Boost, 3D effects. And since the speakers are so small, they're rated for up to 4 hours of music playback, and 150 hours of standby (they charge through an adapter that plugs into a USB port). 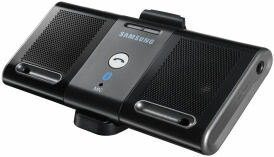 Even better, with Bluetooth-enabled cell phones, the speakers can work as a hands-free and conference call device. This is our wireless future -- the phone connection, media storage, headsets, and speakers, all interconnected to route and share our conversations and entertainment. The Samsung BS300 Bluetooth Portable Speakers (see previous post) are wonderfully small and portable for trips (the same size as portable media players), and put out a respectible 2W of output -- good enough to be heard across a quiet room. But for less controlled enviroments, you can step up the Parrot PARTY Stereo Portable Bluetooth Speakers, with a stronger 6W of output (around $119). Though these are not pocket size at 9 x 3 x 3.3 inches and 21 ounces, they're still quite compact to bring along for some fun -- or to fit easily under a monitor or on a shelf. Besides volume controls, the Parrot PARTY also has buttons for two audio effects -- Stereo Widening and Virtual Super Bass (which reinforced bass frequencies well). 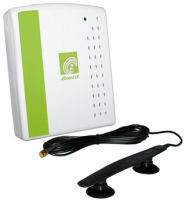 You can use it up to the Bluetooth range of around 33 feet, or it also does have a line-in audio jack. The other way you can use these is for better sound for music stored on your notebook. Use your computer's built-in Bluetooth, or a Bluetooth USB adapter, and then your media player software can be blasting sound through these external speakers. Bluetooth headsets for mobile phones were originally about getting rid of wires, but now they have become our lifelines, as we go though our day's activities chatting away. But it's noisy out there in the world, especially when trying to talk to a small device plugged in our ear. So it's good news as sophisticated DSP (Digital Signal Processing) technology is reduced to fit in even tiny headsets, to provide noise reduction and voice enhancement so both you and your caller can hear more clearly. The bottom line: Today's noise reduction technology really works, in headphones, and even headsets. It's worth the incremental cost to step up to get some of this magic. For example, the BlueAnt Z9 Voice Isolation Bluetooth Headset is a tiny marvel -- It's slick looking, and has dual microphones for voice isolation ($99 / $61). It won a CES 2007 Innovations Design & Engineering Award last January, and was released widely in August. This little bug is small even for a headset (1.5 x 0.69 x 0.44 inches, 0.39 ounces), with a built-in spring clip to attach to your clothes when not in use, and a fully adjustable translucent ear hook. It has dedicated volume up and down buttons, plus the main multi-function button, although it can perform some 20 calling functions (with multiple presses). The Z9's signal processing to separate the voice signal from the background noise works on both the incoming and outgoing signals, with noise suppression, echo cancellation, frequency correction, and automatic gain adjustment of the voice level. A single press of the main button also switches between Standard mode and Max Voice Isolation for extreme noise environments -- with spoken voice confirmation of the change (not just beeps and tones)! In my testing, the Standard mode worked well with various kinds of background noise like trains and machines and fans. The Max mode seemed to work harder, but with noticeable distortion of the voice. The Z9 uses a standard Mini USB Type A interface to charge the battery, which opens the possibility of not having to carry yet another custom charging adapter. It also supports firmware upgrades though USB, although it's a multi-step process to set up. The battery is rated at up to 5.5 hours talk time, 200 hours standby. The BlueAnt Z9 demonstrates how noise reduction technology is coming fast to audio devices, packing more processing intelligence and even voice prompts in to a nice small and lightweight unit. Whatever your preferences for comfort and style for your next headsets / earphones / headphones, definitely look into noise reduction. Wireless headsets for mobile phones are so mono -- designed for only voice calls. But mobile phones are becoming music players -- to sync, download, and stream music in full-up stereo -- which demands that your second ear come into play. - The side of the headset has a sliding boom that extends closer to better catch your voice. And it also serves to answer and end calls. The Voyager also has two-way noise reduction, reducing background noise and adjusting audio levels to enhance sound quality on both ends of the conversation. Plus, it can pair two devices, so you can switch between listening to music and taking incoming calls. And you don't need to get out your devices to operate them -- the headset supports the Bluetooth remote control protocol, with dedicated controls for call and music playback (volume, mute, call answer /end, track forward/back, pause/play). 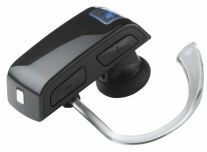 Plantronics also offers the Voyager 815 Bluetooth Headset, a mono version of the 855, without the stereo cable and earbud ($129/$99). Entries posted to Manifest Tech Blog in November 2007, listed from oldest to newest.